What's up with you all? Truthfully, not a lot of writing is being done here. You would think with my foot being wrapped and in a boot because of a dislocated little toe, there would be tons of writing happening. No such thing here. 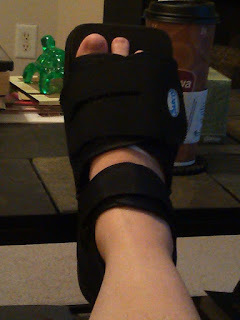 The only thing this dislocated little toe has caused is a bad attitude. Plus, a myriad other things going on in my life and the lives of people I love. Needless to say, I have definitely needed an attitude adjustment. In true Fatherly God fashion He gave me exactly what I needed. It came through a post written by Kelli Wommack on her blog, "Living for One". Kelli shared the acronym LATTE in her post. ON HIM NOT OUR CIRCUMSTANCES. L Laughter happens when we are with friends. Whether we laugh until we cry, or we cry until we laugh, laughter usually occurs and it is so good for us! A Accountability is necessary. We need to have someone in our lives who will remind us of the goals we have set, the promises we have made, the people we were called to be. T Truth must be spoken in love. Good friends don’t just tell us what we want to hear, but what we don’t want to hear as well. And then they are there to encourage us to work through our stuff. T Trust must be present to be good friends. Without trust, we are just acquaintances because we will never share our deepest thoughts and concerns with each other. E Encouragement abounds in friendships. We promote each other, listen to each other, and give each other courage. We pick each other up when we fall or fail, and we walk alongside each other to provide more stability.---Kelli Wommack, "Living for One"
~Laughter was present between myself, my Mom and Aunt. Even when Mom had to stay overnight at the hospital after a heart procedure. Laughter is the best medicine. ~ My Mom has kept me accountable to reading my OBS Study. She is currently in the same group as me and will ask me if I have read our chapter each week. ~ Truth being spoken when the Doc told me it is a good thing my Sweetie hounded me to come and see him concerning my little toe. Because of other issues, it is apparently not good for me to disregard injuries in my "digits," the Doc's words not mine. ~ Trusting my Sweetie to know what is best for me, even when I don't want to admit He is right. ~ Encouragement from family and strangers about my photography work and following what God wants me to accomplish with it. I hope and pray that Kelli's acronym, LATTE will play out in your life this week. Thanks Kelli for continuing to share the messages God puts on your heart. Kelli's actual post is a part of a series she is doing on "REALationships" which deals with friendship. Visit her blog to read the series here.